What Does the Fiscal Cliff Deal Mean for Kids? The American Taxpayer Relief Act of 2012 officially averted the fiscal cliff of combined tax hikes and automatic spending cuts. 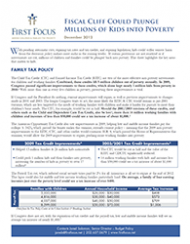 This fact sheet looks at how kids and families fared in the broader budget deal.